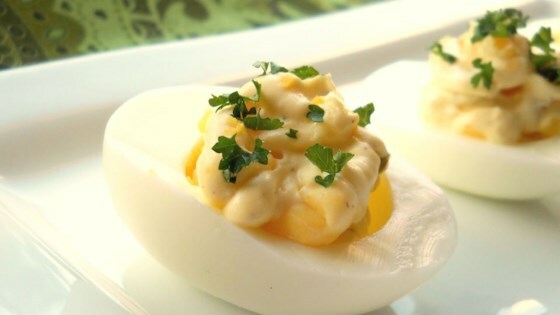 "A cool, creamy ranch and cream cheese mixture with onion and pickle is the filling for these delicious deviled eggs. Omit the onion and pickle, if desired -- they're tasty either way!" Slice eggs in half lengthwise and remove yolks. Place yolks in a medium bowl. Mash together with ranch-style salad dressing. Mix in the cream cheese, then the onion and dill pickle. Fill the hollowed egg whites generously with the egg yolk mixture. Chill in the refrigerator until serving. These was okay... too many onions for my liking. I brought them to Thanksgiving dinner (one of three varieties) - had much more of these left than the other two I made. Excellent recipe for people who don't eat mayo. Definately make again. 5 Stars. Nice going Robin Gibson. N. T.
Made them for a neighboorhood picnic and everyone really liked the light, creamy taste! Also, I garnished the eggs with paprika and slices of black olive. Very good! But I had to add a little black pepper to add some taste. Will make these again. WOW! Everyone really liked these!! Very easy to make, and great any time of the year. Thanks! !